Arteriosclerosis refers to the thickening of the walls of the arteries. It has become a common ailment in modem times, accounting for much of the disability and high death rate, more so among older people. Arteriosclerosis is usually preceded by atherosclerosis, a kind of fatty infiltration in the inner lining of the blood vessel walls. The most risky places for such degeneration are the coronary vessels of the heart and the arteries of the brain. Arteriosclerosis results in the loss of elasticity of the blood vessels and a narrowing of the smaller arteries, which interferes with the free circulation of the blood. Arthrosclerosis, which precedes the condition, involves a narrowing of the arteries, restricting the flow of blood vessels to the various organs and parts of the body from the heart. This cuts the oxygen supply to these various organs, and this occurs due to cholesterol deposits on the walls of the arteries. These deposits then begin to harden with calcification and fibrous tissue, resulting in what is known as arteriosclerosis. The process involving the development of this condition is also referred to as atherosclerotic heart disease and if detected in time can control the condition, although symptoms are most often not present. As these deposits, also referred to as plaque, continue to grow there is a further narrowing of the arteries or the lumen. The lumen is basically the space within the artery for blood flow, and the narrowing of the arteries thereby results in a severely reduced capacity to supply blood to the organs. The organs that are affected by arteriosclerosis will naturally depend on the location of the affected artery. This can eventually lead to a complete blockage of the artery, resulting in tissue death where oxygen supply is cut off, causing problems like heart attacks or strokes. When arteriosclerosis affects the arteries of the heart, causing coronary heart disease the individual would develop conditions like angina, congestive heart failure, or experience a heart attack or abnormal cardiac rhythms. Congestive heart failure is common among the elderly and symptoms may surface in stages. If arteriosclerosis affects arteries that supply blood to the brain, the cerebral arteries, the individual would most likely suffer a threatened stroke, transient ischemic attack, or an actual stroke from death of brain tissue. Arteriosclerosis does not develop overnight, but is a progressive condition that could begin as far back as during childhood. Fatty streaks can in fact develop in the aorta soon after birth and the condition is of particular concern to those with a family history of cardiac disease and high cholesterol. During your early 20s the condition can start to worsen, becoming increasingly severe during by the time you are in your 40s or 50s. Heredity being one of the major risk factors, individuals with a family history of coronary artery disease and high cholesterol should therefore be most watchful for arteriosclerosis symptoms. Arteriosclerosis causes may vary greatly but the risk factors are generally thought to include factors like diet, stress, a sedentary lifestyle, obesity, and environmental factors. Heredity and age are two other significant risk factors that we have little control over, but it would help to be cautious if you fall into any of the risk groups as prompt arteriosclerosis treatment can change the outcome drastically. Arteriosclerosis should be treated very seriously as coronary heart disease statistics reveal it to be the highest cause of deaths resulting from heart disease. Arteriosclerosis symptoms differ depending on the region affected, such as the legs, heart, kidneys, and so on, but irrespective of the area affected treatment should be provided swiftly. Arteriosclerosis treatment or coronary heart disease treatment with natural methods can help to control the condition and significantly reduce the risk of further deterioration, but regular health checks and prescription drugs are still necessary. Arteriosclerosis treatment or congestive heart failure treatment with natural options would typically involve specific diet guidelines and lifestyle modifications. The symptoms of arteriosclerosis vary according to the arteries involved. Signs of inadequate blood supply generally appear first in the legs. There may be numbness and coldness in the feet, and cramps and pains in the legs even after light exercise. Arteriosclerosis that affects arteries to the legs may cause severe pain in the legs and such a decreased blood flow to the legs is referred to as Peripheral Vascular Disease. This type of arteriosclerosis can cause severe leg pain, which tends to be more pronounced when walking. In severe cases the pain will even occur when at rest or when sleeping and wounds may refuse to heal properly, possibly resulting in infection. 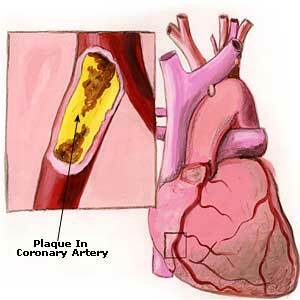 If the coronary arteries are involved, the patient may have sharp pains, characteristic of angina pectoris. When arteries leading to the brain are involved, the vessel may burst, causing haemorrhage in the brain tissues. A cerebral vascular stroke, with partial or complete paralysis on one side of the body, may result if there is blockage with a blood clot. It may also lead to loss of memory and a confused state of mind in elderly people. If arteries leading to the kidneys are involved, the patient may suffer from high blood pressure and kidney disorders. Arteriosclerosis that affects the kidneys can also result in kidney failure, leading to death. Arteriosclerosis that affects the heart may cause symptoms like shortness of breath, chest pain, sweating and anxiety. Chest pain referred to as angina occurs as a result of a lack of oxygen supply to the heart muscles and tends to occur with exertion, while disappearing when at rest. Arteriosclerosis can be so problematic mainly because the symptoms of arteriosclerosis do not surface until the lumen is considerably narrowed or blocked, affecting the dependent organ. Arteriosclerosis causes symptoms that can therefore vary greatly, from heart attacks or strokes, to numbness in certain parts of the body, angina, organ damage or failure and so on. At times there may be no warning signs and the person may simply suffer a fatal cardiac attack. It is therefore important that if you are past the age of 20 or in any of the risk groups to go for regular health checks, as an early diagnosis can help prevent such fatal developments. The most important causes of arteriosclerosis are lack of physical exercise, excessive intake of white sugar, refined foods, and a high fat diet rich in cholesterol. Obesity and a lack of physical activity are the most common risk factors that can also be most easily controlled. Diets that are high in saturated fats, red meats, dairy products, junk foods, oil foods and other refined products, while lacking in fresh fruits and vegetables put you at high risk. Other diseases such as high blood pressure, obesity, and diabetes may also cause hardening of the arteries. Emotional stress plays an important part, and heart attacks are more common during periods of mental and emotional disturbances, particularly in those engaged in sedentary occupations. Age: As you age you are at increased risk of developing arteriosclerosis which is why regular health checks are recommended. Heredity also plays its role and this disease runs in families. Arteriosclerosis causes are not completely understood but there are several risk factors that have been identified that contribute to the development and progression of the condition. Some of the risk factors for arteriosclerosis are not controllable, while others are. Controllable Risk Factors: High blood pressure puts you at high risk, but the condition can be effectively controlled with medication and appropriate lifestyle changes. Timely diagnosis of high blood pressure and appropriate treatment can therefore help prevent arteriosclerosis. High cholesterol levels in the blood are another risk factor and this can be identified again through regular health checks and may be controlled with medication and lifestyle modifications. Smoking puts you at high risk of developing arteriosclerosis and it is imperative that you kick the habit. Diabetes is another health condition that can cause arteriosclerosis and should be treated seriously with appropriate medication and diet changes. One of the most effective home remedies for arteriosclerosis is the lemon peel. It is believed to be one of the richest sources of vitamin P. It strengthens the entire arterial system. Shredded lemon peel of one lemon may be added to soups and stews, or sprinkled over salads. To make a medicine, the peel of one or two lemons may be cut up finely, covered with warm water and allowed to stand for about twelve hours. A teaspoon may be taken every three hours, or immediately before or after a meal. Parsley is another effective remedy for arteriosclerosis. It contains elements which help to maintain the blood vessels, particularly the capillaries, and arterial system in a healthy condition. It may be taken as a tea: a teaspoon of dry parsley may be allowed to simmer gently in a cupful of water for a few minutes. This can be taken two to three times daily. Beet juice, taken daily, has been found valuable in arteriosclerosis. It is an excellent solvent for inorganic calcium deposits. The juices of carrots and spinach are also beneficial if taken once a day. These juices can be taken individually-500 ml, or as a combination. When taken as a combination, they should be in the following proportion: carrots-300 ml and spinach-200 ml to prepare 500 ml of juice. Honey is also considered beneficial in the treatment of arteriosclerosis. It is easily digested and assimilated. The patient should take a glass of water with one teaspoon each of honey and lemon juice in it, before going to bed. He can also take it if he wakes up at night. The herb psyllium husk, botanically known as Plantagoovata, has been found valuable in arteriosclerosis. The oil of the seeds of this plant should be used. It contains fifty per cent of linoleic acid, an unsaturated fat, and is, therefore, helpful in the prevention and treatment of this disease. Recent investigations have shown that garlic and onions have a preventive effect on the development of arteriosclerosis. They should be included in the daily diet, either raw or cooked, according to individual taste. To begin with, the patient should resort to a juice fast for five to seven days. Fresh, raw vegetables and juices of seasonal fruits may be taken three times a day. After the juice fast, the patient should take a diet consisting of seeds, nuts, grains, vegetables, and fruits, with emphasis on raw foods. Further short fasts of juices may be undertaken at intervals of three months or so, depending on the progress being made. The patient should take several small meals instead of a few large ones. He should avoid all hydrogenated fats and an excess of saturated fats, such as butter, cream, clarified butter, and animal fat. He should also avoid meat, salt, and all refined and processed foods, condiments, sauces, pickles, strong tea, coffee, white sugar, white flour, and all products made from them. Vegetable oils, particularly safflower oil, flax seed oil, and olive oil, should be used as a cooking medium. During the juice fast undertaken for the first five to seven days, a warm-water enema should be used daily to cleanse the bowels. Smoking, if habitual, should be given up as it constricts the arteries and aggravates the condition. The patient should undertake plenty of outdoor exercise and learn to take mental stress and worries in his stride. A prolonged immersion bath at room temperature should be taken at bedtime on alternate days. This bath should be administered in a bath tub properly fitted with a hot and cold water connection. The bath tub should be filled with water at a temperature ranging from 33.4°C to 36.7°C, and the patient should lie in it for an hour or so. The head should be kept cold with a cold compress.